This tutorial will help you setup your linksys wrt54g wireless router with your Windows 7 Operating system. 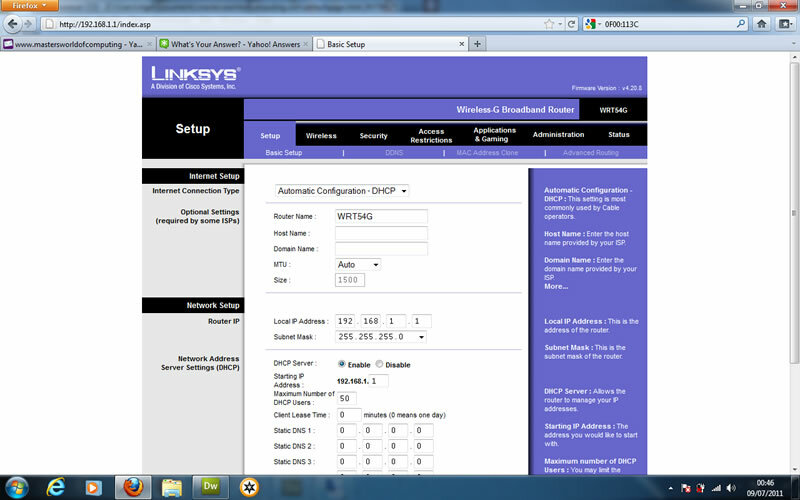 To access your linksys wrt54g router interface you need to open a web browser, ie Internet explorer, Firefox. Once you have opened the browser type in to the address bar this address "192.168.1.1" do not type in the "" marks. Click on the "Wireless" tab and your screen will change to the one below. where it says Wireless network name (SSID) write down the name that is in the box next to it. In this case it says "network name"
When you have wrote that down click on the "Wireless Security" tab your screen will now change to the one like below. 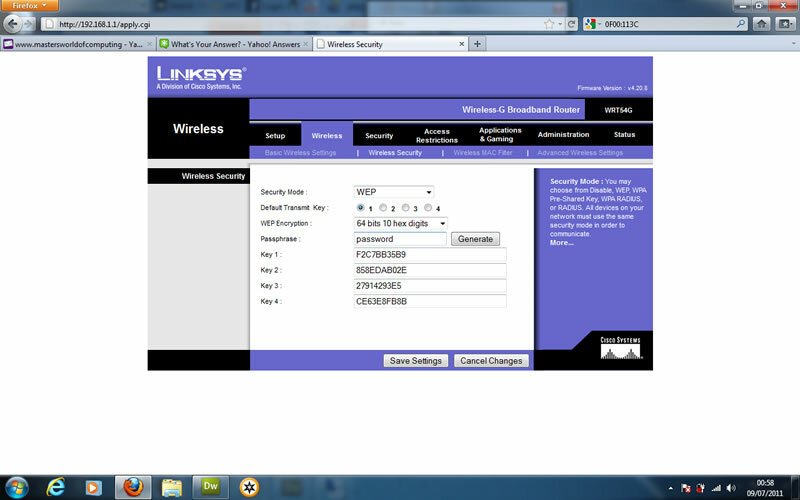 This is where you can see the type of security enabled for wireless networks on your router. Where it says "Security Mode" you will notice this one in the screenprint says "WEP" it is possible yours will say something else like "WPA" or "wpa2" it does not matter which one it says. For now just write down what it does say using your pen & paper. :) The next line says "Default Transmit Key" you will see in the screenprint I have seected "number 1" I want you to do the same. "WEP Encryption" write down what it says for "WEP Encryption" mine says " 64 bits 10 hex digits" you can set yours to the same on the understanding you want to use "WEP"
"Passphrase" here you can type in a passphrase for your encryption so come up with a phrase you can remember for this tutorial I used simply "password" as my passphrase. Once you have typed in a passphrase click on the button which says "Generate" The boxes below Key 1, Key 2, Key 3, Key 4, will now fill with numbers. I want you to copy down the number for "Key 1" in this example it is "F2C7BB35B9"
This is your encryption key write this down on the paper you got earlier. Now click on "Save Settings" and exit the browser window. We will know continue to setup the encryption key in to your Windows 7 Operating system.